* On Hill Performance Evaluation by Brian Whatley, Level 3. We have been active with the "On Hill Performance Center" concept for years. Our location at Stratton Mountain, Vermont is truly unique. We are 50 yards from the lifts. This convenient location coupled with our staff completes an extraordinary opportunity. Stratton has put a new lift in behind our shop that will give immediate access to mid mountain skiing and allow for summit access very easily. 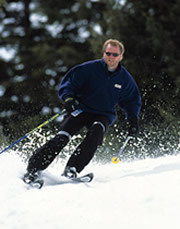 We have access to an entire Demo ski fleet and of course our boot lab. The point is that what we see inside statically may be absolutely wrong once you are actually skiing and dealing with gravity etc. Brian will be able to determine what the issue is, pilot error or wrong equipment and make appropriate suggestions. Make your reservations now, this is a hot program. The photo above is James. The left photo is before we made any changes to his skis and boots. 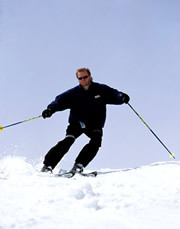 He is an avid athlete and ice hockey player but due to his bowed legs was having a tough time skiing. The photo on the right is after the changes were made, as you can see he is much more relaxed and both skis are on the same edge angle relative to the snow. He is looking where he wants to go rather than looking where he will end up! This is C.K. She comes from a family of skiers. She was frustrated that skiing took so much energy although she was in great shape. The photo on the left shows her skis are very flat on the snow, no edge angle, and she has a look of trepidation on her face. The photo on the right, after changes were made shows much more symmetry in her legs, with the wind in her face and she is flowing down the mountain rather than holding back and fighting gravity. 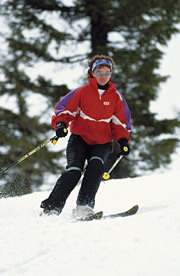 She was able to ski much more comfortably and with a lot more stamina. 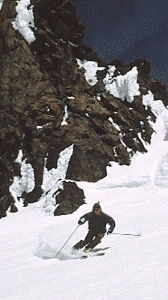 Skiing steeper terrain like this, especially when you are not used to it, can physically drain you in no time, no matter how strong you are. I was given the benefit of a balanced system to help me deal with these conditions. 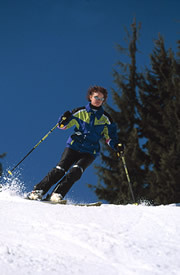 Notice how both skis and both legs are on the same angle relative to the snow. If you feel as though you have hit a performance plateau make a reservation to ski with Brian Whatleyat our Performance Center. At Ski Magazine's Boot Test we did some time trials with ex World Cupper Monique Pelletier. With a balanced ski and boot system she consistently scrubbed 1 1/2- 2 seconds off her time on a 20 second course. Yahoo!!! call: (802) 875-1122 An appointment is required for all services. © 2018 by GMOL. All rights reserved.